When this card is Special Summoned: You can target 1 Wyrm-Type monster in your Graveyard, except "Magma Dragon"; Special Summon it in Defense Position, but its effects are negated. You can only use th.. If this card battles an opponent's monster, during damage calculation (in either player's turn): You can activate this effect once per battle; your opponent takes no battle damage for the rest of this.. Cannot be used as a Fusion, Synchro, or Xyz Material for a Summon. While this card is face-up on the field, it cannot be Tributed. During your End Phase: You can target 1 card in your Pendulum Zone; d..
1 "Melodious Maestra" monster + 1 "Melodious" monster. Cannot be destroyed by battle or by card effects, also you take no battle damage from attacks involving this card. 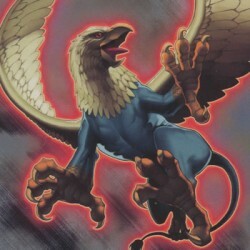 If this card battles a Special..
3 "Frightfur" monsters. Must be Fusion Summoned and cannot be Special Summoned by other ways. If this card attacks or is attacked, your opponent cannot activate cards or effects until the end of the D..
1 Tuner + 1 or more non-Tuner monsters. Once per turn, during either player's turn, when another Level 5 or higher monster activates its effect on the field: You can negate the activation, and if you .. Reveal any number of "Performapal" monsters from your hand and shuffle them into the Deck, then draw cards equal to the number of cards you shuffled into the Deck +1. You can only activate 1 "Performa.. Reveal 1 Fusion Monster in your Extra Deck and add 1 of the Fusion Materials listed on that card from your Deck or Graveyard to your hand, and if you do, for the rest of this turn after this card is a..
You can banish 1 "Polymerization" Spell Card or "Fusion" Spell Card from your Graveyard, except "Diffusion Wave-Motion"; Fusion Summon 1 "Frightfur" Fusion Monster from your Extra Deck, using monsters..
Fusion Summon 1 "Frightfur" Fusion Monster from your Extra Deck, by banishing Fusion Materials listed on it from your side of the field or your Graveyard. You can only activate 1 "Frightfur Fusion" pe..
Target 1 Set Spell/Trap Card on the field; destroy it. During your Main Phase, except the turn this card was sent to the Graveyard: You can banish this card from your Graveyard, then target 1 face-up .. If your opponent has 2 cards in their Pendulum Zones: Target those 2 cards; while both targets are in their Pendulum Zones, you can Pendulum Summon using their Pendulum Scales this turn, but only from..